Flipkart raises Free Shipping Limit from Rs. 300 to Rs. 500! While the price war continues among other e-commerce portals, Flipkart is slowly taking the other route. 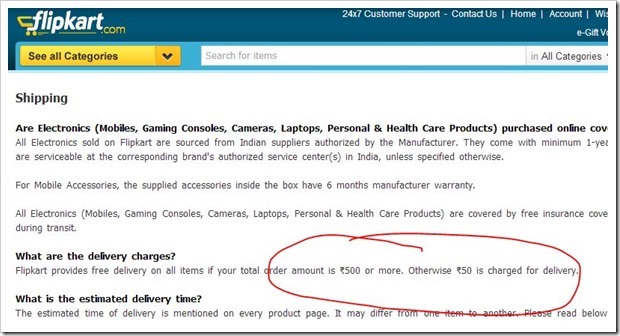 Flipkart has recently increased the free shipping limit from Rs. 300 to Rs. 500. So going forward if your total order amount on Flipkart amounts to less than Rs. 500, you will be charged shipping charges. So, the free shipping limit as well as the shipping charges both have been increased. Earlier, Flipkart had a limit of Rs. 300 above which the shipping was free and the if the order value was below Rs. 300, the shipping charges were Rs. 30. Now, Flipkart will have a limit of Rs. 500, below which the shipping charges will be Rs. 50. In July last year, Flipkart had raised the same limit from Rs. 200 to Rs. 300. When Flipkart started, it banked on price competitiveness – however, now they believe that they have established themselves enough to justify the rise in shipping charges. The segment that will be affected most will obviously be low priced products, especially books. So, lets say a user wants to buy a book worth Rs. 250, he will actually end up paying Rs. 300 for the same book. For eg: the book given below priced at Rs. 236 will actually cost Rs. 286 to the user. 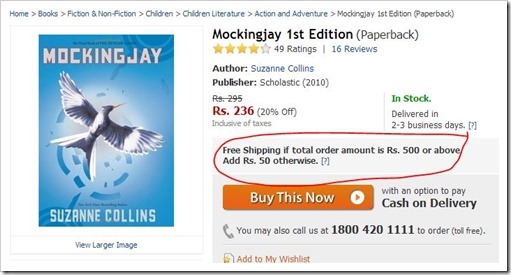 For Flipkart, book sales will definitely be affected with this raise. However, Flipkart seems to have taken a calculated risk as many users may now be moving towards e-readers and electronic books. Looks like Flipkart wants to stay competitively priced for e-books on their Flyte store, while they want to bring down their reliance on physical book sales. In my opinion, this increase is not a small change, and it may end up affecting Flipkart sales negatively, especially considering the fact that other Indian online stores offer either free or much lower free shipping limit (like in case of Infibeam, which offers Rs. 250 limit and Rs. 30 shipping charges below that). Other noticeable aspect is Flipkart prices – in most cases, Flipkart prices are now atleast 10 to 20 percent higher than competing online shops. For example the “Mockingjay 1st edition” book costs Rs. 236 on Flipkart, Rs.221 on Infibeam and Rs. 204 on Homeshop18.com. The point I am trying to make is – Flipkart is neither low on prices nor have lower shipping rates and their famed service keeps coming in news due to negative incidents like these. Do you think these recent developments will make customers move away from Indian E-Commerce poster boy? Online market is a very competitive market in my opinion. Flipkart feels that it has established itself in trustworthiness(which I totally agree they have) and now has a right to take whatever price they want, then I guess they are totally wrong. An Indian buyer is very price conscious and will move to other sites which are still cheap. Example, I used to buy almost every item from Flipkart, but last December, I thought of buying a Sony Xperia Tipo, and saw their prices. It was 9500 in Flipkart and 8700 in a Ecommerce site called Adexmart. Although I thought hard about trying a new site, the difference was too much. To add to that Adexmart delivered the item in 3 days (same as Flipkart). Now I only buy books from Flipkart but due to this additional cost in novels etc. , I will look to other sites as my better options, even the book stores. My online shopping pattern does not symbolizes every customer but I feel that it do applies for majority in India. I have been primarily using Flipkart because there search is awesome and it is easy to find products and read reviews. Then i either move to ebay.in or infibeam.com and place order. Looks like I should continue doing the same. I am highly demotivated to buy from flipkart now. I was a big fan of flipkart but Rs500 minimum is too much to ask for. Here, I believe Flipkart is counting on the trust and loyalty they have built in their user base. So to them this wont make much of a difference. Lets wait and watch how consumers react. So what exactly happened is… Everyone thought to gain user base by getting into a Price War way back in 2010-11, that was the time I had to shut down my show RING-a-BOOK, now they started increasing the price and shipping thinking many ecomm and startups are dead but these guys did not knew that “they were offering Cocaine” to the user by offering discounts below actual cost. Now the user is addicted to it, you raise the price and think people will stick to you just because you deliver in 1-2 days is not gonna happen. Users are ready to wait for an additional day or two to save 20-40 bucks extra. Way to go @flipkart ! Tushar – Let me tell you regular online Indian buyers are very price conscious. It is ok if the price difference is 0 to 5%, but the kind of rates Flipkart now has are nearly 20% higher than others. Also, street prices are way lower than online sites even today… In such a situation, I am not too sure if increasing the prices or free shopping limit is the solution. Yes, I am aware that they are still not making money, but increasing prices is going to hurt them more because sales are obviously going to come down!